went home to be with her Lord on February 4, 2019. Helen was born on August 24, 1926 to James Francis Regal and Alice Marie Mullen in Emmet, Nebraska. Helen graduated from St. Joe’s High School in Atkinson, NE. She married Forrest D. Riley on August 18, 1947. To this marriage six children were born. Helen was a member of St. Patrick’s Catholic Church in O’Neill. She worked for the O’Neill Photography and St. Anthony’s Hospital for many years. After her retirement she faithfully volunteered for the St. Pat’s Church where she enjoyed cleaning the parish with her friends. Helen loved game and mystery shows. 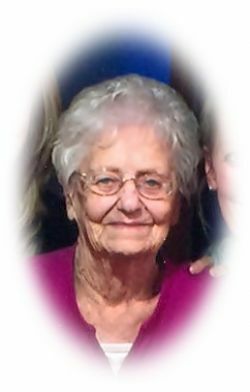 She loved playing cards and working crossword puzzles, watching sports but more than all she enjoyed time spent with her family. Helen is survived by a daughter Judy (Tom) Frerichs of North Platte, sons Robert of Fremont, Ron (Brenda) of Grand Island, Jack (Sandy) of Woodland Park, CO., Steve (Debbie) of Fremont and daughter Mary Jo (Kevin) Giesselmann of Elkhorn. She is also survived by 17 grandchildren and 27 great grandchildren. Helen was preceded in death by her husband Forrest, 2 brothers, 1 grandchild and one great grandchild. The Funeral Mass will be Friday, 10am at St. Patrick’s Catholic Church in Fremont. Visitation will be Thursday from 3pm to 7pm with the family present from 5-7pm with a wake service at 7pm all at the Ludvigsen Mortuary Chapel in Fremont. Memorials may be directed to the family. Burial will be Friday at 3pm in the O’Neill Cemetery.